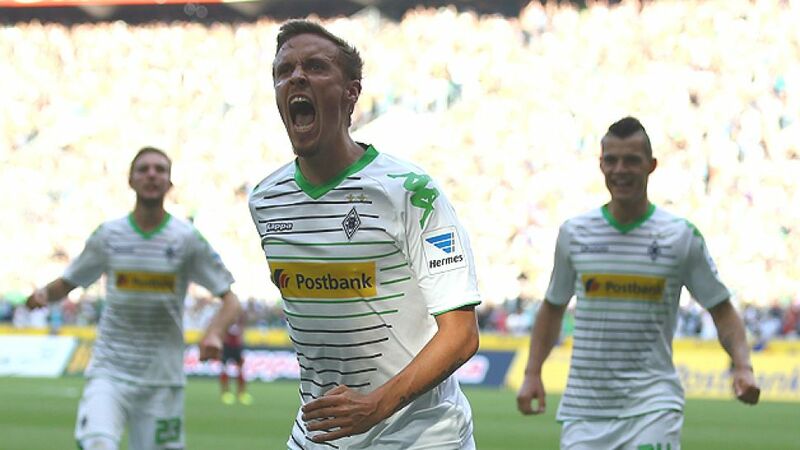 Mönchengladbach - Borussia Mönchengladbach comfortably dispatched Hannover 96 3-0 to record their first victory of the 2013/14 campaign. Max Kruse, signed in the summer from SC Freiburg, got things underway for Lucien Favre’s men in the first half, before Christoph Kramer’s maiden top-flight goal and a Filip Daems penalty secured an easy win against a Hannover team seemingly struggling with their away form. Mönchengladbach had lost their opening game against FC Bayern Munich last weekend, but their performance was encouraging, particularly that of Kruse. Unsurprisingly, the 25-year-old Germany international kept his place as leader of the Foals' attack, and he was immediately involved in the home side’s bright start to the game. He combined well with Raffael as the Brazilian attacking midfielder fired wide of the target, before then playing his part in a move that ended with Juan Arango sending a deflected effort narrowly over the bar. Dominating a rather passive Hannover, Lucien Favre’s men then went in front on the 20-minute mark, with Kruse opening his Borussia account in style, sweeping in a finish from Raffael’s cutback. The home side remained very much in the driving seat, with Hannover’s right side looking particularly vulnerable. Japan international right-back Hiroki Sakai had to make a last-ditch challenge to deny Raffael, before the Reds were grateful to goalkeeper Ron-Robert Zieler for keeping the deficit down to one on the stroke of half time. The former Manchester United FC custodian had to be at full stretch to palm clear Arango’s precise drive, with Raffael skewing the rebound wide. Hannover introduced Artur Sobiech in place of Leo Bittencourt after the break, but it made little difference to the pattern of the game as Gladbach pretty much picked up where they had left off. Sakai made another crucial intervention to deny Kruse, before Kramer darted through, only to see his lob cleared off the line by Salif Sane. There was nothing Sane could do moments later, though, as the youngster bundled in his first top-flight goal after Kruse’s effort had hit the post. Led by winger Szabolcs Huszti, Hannover attempted a fightback, and the Hungarian tested Marc-Andre ter Stegen with a low free-kick, as well as whistling a deflected effort wide. However, they were soon picked off again. Patrick Herrmann led the counterattack and played in Kruse, who forced the valiant Sakai into a handball, with Daems nervelessly converting the resultant spot-kick. The tireless Raffael almost added a fourth, which would have been harsh on Mirko Slomka’s men, who themselves would have had a consolation goal to celebrate but for the brilliance of ter Stegen, who saved expertly from Sobiech and substitute Mame Diouf, ensuring a hugely pleasing day all round for the Borussia Park faithful.